Dogs' Sense of hearing is truly remarkable considering they begin life with sealed ears, unable to hear at all. 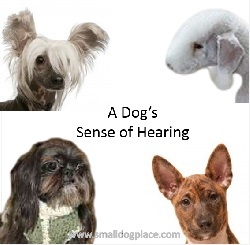 When it comes to the sense of hearing, your small dog’s ability to hear far outranks yours. Even with floppy ears, their hearing is more sensitive and versatile than yours. Dogs with ears that stand upright have even better hearing. You share the same ability to hear low frequency sounds, but there are high-pitched sounds that we cannot hear and they can hear. To get some idea of this ability, think about the piano with its 88 keys. You would need to add four more octaves about the highest note to hear what dogs can hear. It is easy to forget and get annoyed at this ability in our fur babies. When all is quiet and still, your dog suddenly perks up, runs to the door or window and starts to bark. You reluctantly follow only to see nothing. What you could not see, they can hear. I always joke that my dogs are barking at the squirrels and chipmunks in the neighbor’s yard, but in reality, they may be doing just that. 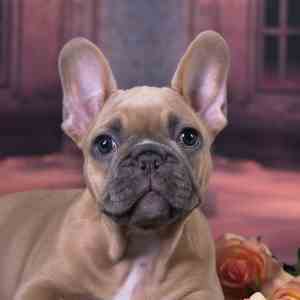 Puppies are born deaf with their ears sealed shut. By about two weeks of age, their eyes begin to open and the ears follow shortly afterwards. By the time a puppy reaches four weeks old they are hearing as well as an adult dog and can hear about four times the distance of a human with normal hearing. Why Do Dogs Hear Better Than Humans? A Dog's Anatomy Allows Them to Hear Better. The anatomy of yours and your dog’s ears is very similar with a few exceptions. One difference lies in the ear flap or pinna. Your ears are attached to the side of your head facing sideways. A dog's ear, especially those dogs who hold their ears erect have an advantage over people because sounds can be detected in many different directions. There is even a hearing difference among dog breeds. Those with floppy ears covered with hair won't be able to hear as well as those with erect ears and no hair. Ear Muscles Make a Big Difference for Dogs. Dogs sense of hearing rely on their more than 18 muscles at the base of their ears. Compare that to our 6 ear muscles. Eighteen muscles seem like a lot, but consider the cat has 30! This allows them to move their ears to pick up sounds in many different directions. Think of these muscles as tiny instruments moving an antennae or radar in the direction of the sound. 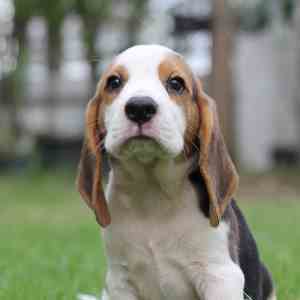 They can turn, raise and lower their ears, even tilt them in different directions. People, on the other hand, have limited ability to move their ears. Most cannot move their ears at all. How many people do you know that can wiggle their ears? The Frequency Range of Dogs is Superior to Humans. 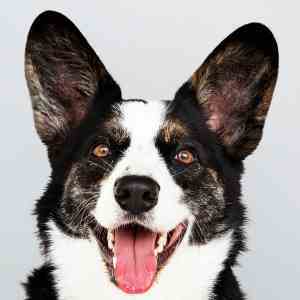 Dogs can attribute their ability to hear sounds at high frequency to their evolutionary past. Wild dogs, wolves, and foxes prey on small rodents that make high-pitched sounds as they move. The ability to hear these sounds give dogs an advantage when hunting their prey. Humans can hear between 20 and 20,000 Hz which seems like a lot. Dogs, however can hear a frequency range of 40 to 60,000 Hz. The smaller the number the lower the sound and their higher the number the higher the pitch. As an example, a dog whistle emits a sound above 20,000 Hz which means people can't hear it but dogs can. Another unique characteristic that does possess and people do not is their ability to hear sounds with each ear independently. They can be listening to normal house sounds and pick up something outside at the same time. Fortunately with this amazing hearing ability they also have a way to filter out sounds. They have selective hearing choosing which sounds they will pay attention. Have you ever noticed that dogs will sleep soundly through a television show only to wake up abruptly at the sound of a barking dog on the TV? Dogs begin to lose their hearing as they age similar to people. Ear infections, trauma, and loud noises also lead to hearing loss. Some dogs suffer from congenital deafness, meaning they are born deaf. 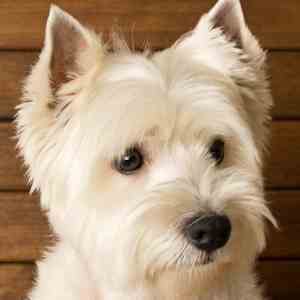 There are at least 100 breeds that been identified as having the potential for congenital deafness. A BAER (Brainstem Auditory Evoked Response) test to detect activity in the auditory pathways to the brain. It is performed by a veterinarian on puppies. The Shape of a dog's ear has some correlation between the dog's sense of hearing. A dog with a prick ear will likely hear better than one with a drop ear. 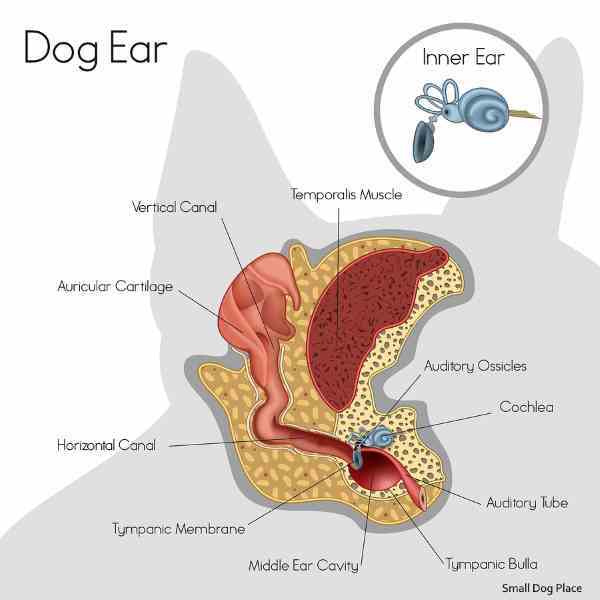 To protect our dog’s hearing, prompt attention and treatment for ear infections is important. Since we know that loud noises can harm our fur baby’s ears as well as our own, we would do well to avoid situations where our hearing could be compromised. Thunderstorms and Fireworks are two well known causes of distress in some dogs. This amazing ability to hear does have its drawbacks. Just as people filter out unnecessary incoming visual pictures, dogs learn to filter out invasive sounds. If they don’t some of these dogs will suffer from phobias of fireworks, thunderstorms and even sirens. One of my dogs, a little Maltese named Jasmine, hates garbage trucks and will bark and race to the door every time one stops at or near the house. Perhaps the sounds generated with trash being compacted has a negative effect on her ear. This dog's sense of hearing is extremely keen. Dogs with these auditory sensitivities can benefit from music therapy as a way to sooth and create a calm environment. If you found The Dogs Sense of Hearing Helpful, check out these other senses.